Surfers Paradise River Cruises offers the best valued morning cruise, midday cruise, afternoon cruise, sunset and private party cruises on the Gold Coast starting at just AUD20 per person. They showcase the best of the Gold Coast's waterways - river, canal and broad water. Sit back relax and enjoy the magnificent views as you cruise past homes of the rich and famous. Try one of the scrumptious cocktails or an icy cold beer from the well stocked bar. Complimentary morning tea & snacks are served whilst you are cruising the river and waterways. 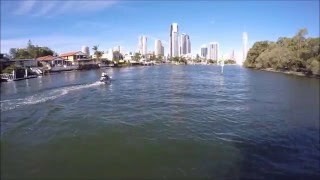 You will enjoy a fun facts commentary pointing out some of the interesting sights as you pass through the Gold Coast's canal and river system. Surfers Paradise River Cruises offers cruises seven days per week. Whether you are a Gold Coast local or visiting from interstate or internationally, this cruise will be sure to be an enjoyable experience for everyone. Be sure to bring a camera to capture the spectacular Surfers Paradise skyline photos and keep a lookout for the dolphins that call the river system home. The friendly team at Surfers River Cruises looks forward to welcoming you on board. Enjoy a relaxing morning coffee cruise on the beautiful Gold Coast waterways. 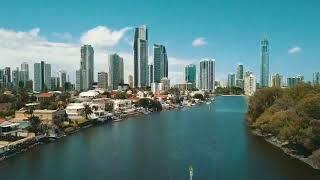 Surfers Paradise River Cruises will show you the homes of the rich and famous whilst cruising the smooth canals and river system of the Gold Coast, whilst you enjoy morning tea served on board. Departing Surfers Paradise they cruise past Chevron Island, Paradise Waters and then on to the Broadwater, Marina and Palazzo Versace hotel before turning around at the southern end of Seaworld. They also include a fun facts commentary including history, house prices and other interesting information. Have your camera ready for that once in a lifetime picture. 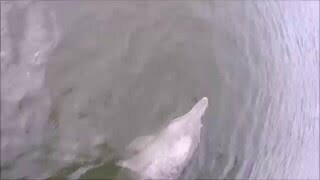 Also keep a lookout for the local pod of dolphins. This Gold Coast river cruise will be the highlight of your year. Enjoy a one and a half hour midday cruise. 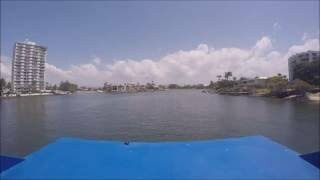 What better way to see the Gold Coast than from the water. It's a perfect chance to sit back, relax and enjoy it with a loved one or a group of friends. It is all smooth water canal cruising, with an upper sun deck where you can get that perfect photo opportunity. Cruising past million dollar homes and yachts, your one and a half hour lunch cruise will be a great way to spend a day on the Gold Coast. They include a fun facts commentary and have a licensed bar on board. This great valued Gold Coast cruise caters for groups, families, couples and individuals and is sure to be the highlight of your day - whether you're a local or a visitor to the Gold Coast. Enjoy a one and a half hour cruise including some savoury snacks. What better way to see the Gold Coast than from the water. It's a perfect chance to sit back, relax with a glass of wine and enjoy it with a loved one or a group of friends. It is all smooth water canal cruising, with an upper sun deck where you can get that perfect photo opportunity. Cruising past million dollar homes and yachts, your one and a half hour lunch cruise on Bluewater Cruises will be a great way to spend a day on the Gold Coast. Enjoy a one and a half hour spectacular sunset cruise on the Gold Coast's waterways including savoury nibbles. As the beautiful Gold Coast sun sets, it's a perfect chance to sit back, relax and enjoy it with a loved one or a group of friends. It is all smooth water canal cruising, with an upper sunset deck where you can get that perfect photo opportunity. With a glass of bubbly and some cheese and crackers you can watch the sun set whilst cruising the beautiful Broadwater canals and waterways of the Gold Coast. Your one and a half hour sunset charter cruise on Surfers Paradise River Cruises includes an informative fun facts commentary and is sure to be a spectacular finish to a glorious Gold Coast day. The price includes your Gold Coast waterways and Broadwater canal cruise and savoury nibbles. A fully licenced bar with sunset cocktails of the day at affordable prices will make this an unforgettable evening. You won't find a more relaxing or better value cruise on the Gold Coast. This cruise is seasonal, high season only. Please call. Private Party Cruises are all inclusive. Birthday Parties, Hens Parties, Corporate Parties,Christmas Parties. Exclusive private boat hire for your group. Disabled access available (please not toilets are not wheelchair accessible). Fully Licenced Bar – Beers, wine and champagne. 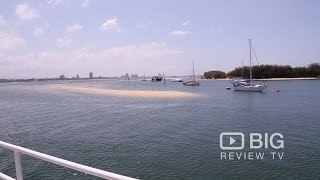 Sightseeing deck – great for spectacular Gold Coast photos. On-board music system – bring your own music.